The Magic School Bus Rides Again! Image Concept art from original Netflix announcement in 2014. In this era of remasters and remakes, everything that is old is new again, including Miss Frizzle and her class. 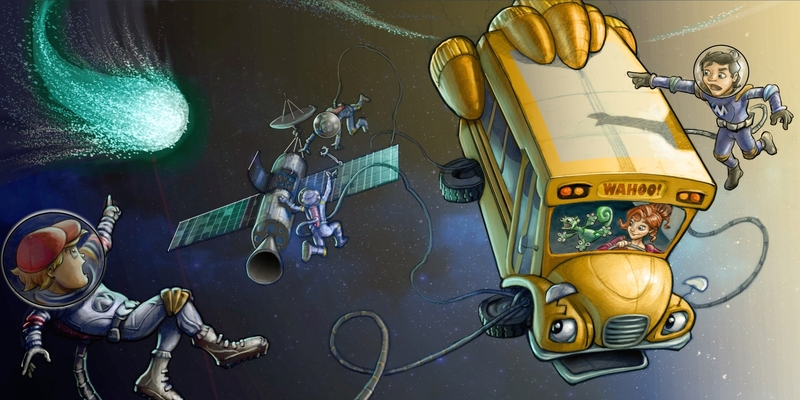 The Magic School Bus returns September 29th with a new cast, art style, and new episodes on Netflix! Your browser does not support inline iframes. Visit The Magic School Bus Rides Again | Main Trailer | Netflix. This is a project that has been in the works for a few years, after Netflix acquired the rights to reboot the show in 2014. Originally billed as The Magic School Bus 360°, Netflix revealed the new name and some of the cast back in February. Lily Tomlinopens a new window is returning as Miss Frizzle; now upgraded to Professor Frizzle, Kate McKinnonopens a new window is playing Miss Fiona Felicity Frizzle, and the theme song originally performed by Little Richard is now being performed by Lin Manuel Miranda. When I was growing up, rainy days meant one thing: indoor movie day! These were generally a regular rotation of educational programming, such as the BBC and DK Vision series, Eyewitness, and episodes of The Magic School Bus. Even though I'm no longer the target demographic, I'm still very excited at the idea of a new slew of Magic School Bus episodes and the new generation of kids that will hopefully enjoy them as well (assuming they're good, that is!). The Library has tons more Magic School Bus titles to keep you entertained. Take a look and choose your favorites. What memories do you have of The Magic School Bus? Do you have a favorite children's program? Let us know in the comments below!